“We spent three days at Kelimutu Ecolodge and I wish I could stayed longer. Our bungalow was absolutely gorgeous with view over the river and the rice fields. Between our exploring trips to waterfall, hot springs and Kelimutu, we spent hours looking at the view and enjoying the natural beauty and quietness of the place (along with some cold Bintang beers and delicious homemade guacamole). Kelimutu Crater Lakes Ecolodge is simply idyllic! 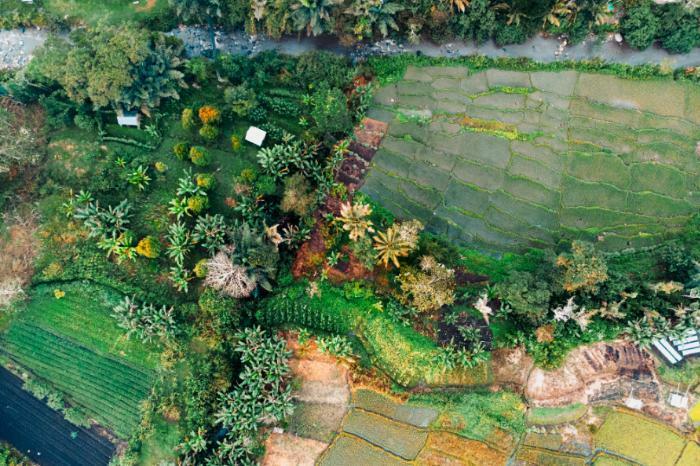 Set in beautiful gardens on the edge of a rainforest, in a valley of rice paddies, beside a babbling river with breath taking views of Mount Kelimutu. This is a magical place where you can enjoy the perfect start to each day; sipping tea on your veranda, watching the sun rise over our spiritual mountain and tranquil landscape. We offer the perfect base to explore the fascinating culture and natural beauty of Flores, so that you can truly relax and choose your own adventure - whether you want to see Komodo Dragons, multi coloured lakes, smouldering volcanos, stunning beaches, jungle hikes or cultural delights. The Kelimutu volcanic crater lakes are situated at 1,400 metres above sea level and the water in the lakes is known to mysteriously change colour. Over the years the lakes have changed from white, turquoise and red, to black and walnut, to stunning shades of green. For the local Lio people this is a sacred area that runs deep with legend. Kelimutu is the home of the spirits of people with special powers. For ordinary mortals their spirits enter between the two enormous rocks - Konde (queen) and Ratu (king) found at the side of the road to the National Park, known as Konderatu: The Gate of the Spirits. From the lodge spend some time in our beautiful tropical gardens where we also grow organic fruit, vegetables, rice and soon – our own coffee! 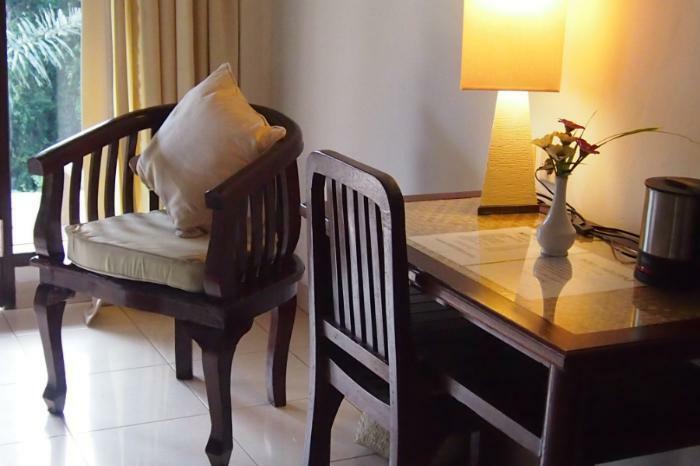 You are welcome to explore the property and enjoy the tranquillity of our environment. The must-see experience at Kelimutu is the spectacular coloured crater lakes which are breath-taking to see at sunrise. Our tour leaves at 4:30am daily and gets to the lakes before dawn. Most people feel the spiritual call of the lakes as the sun brings warmth to the day. On the way down from the lakes, you will hear the songs of the Bare Throated Whistler; which mimics other birds and sounds. Enjoy up to 18 different songs from a single bird! From the lodge the village of Moni with its traditional Chief’s house, is only a 15 minute walk away and is a great base for bird watching, hiking and experiencing the fascinating local culture. 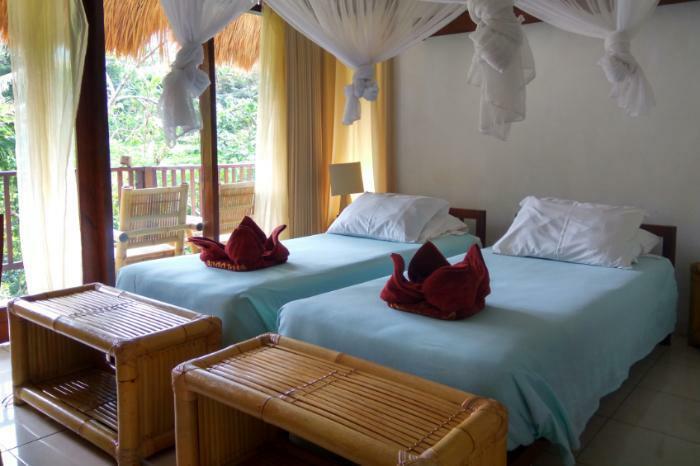 As with all of our Ecolodge experiences we will help you plan the perfect itinerary to make the most of your stay here. Families are welcome at Kelimutu Ecolodge. A passion for conservation can start at a very young age and we revel in the opportunity to inspire young people with the beauty and excitement of our amazing wildlife and natural treasures. Our property is comprised of 21 clean, comfortable private rooms each with stunning mountain views and the constant soothing sounds of the rambling river. Sixteen rooms are in private cottages and five are above the restaurant. The gardens are our pride and joy, not only functional but simply beautiful, set over 6 hectares. 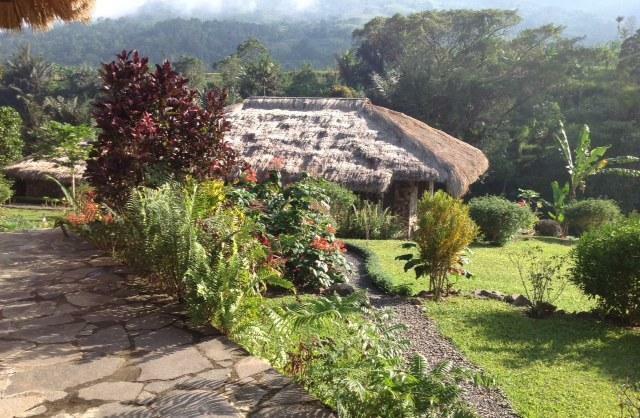 The Ecolodge ethos is clear, we exclusively employ local people who live in the Moni area, and are dedicated to educating and empowering the local community in long term conservation and sustainable development. Our staff are like family and they will make you feel like family too. We also provide; laundry service, bar, tour information, local guides, airport services and full restaurant for all meals including feasts for special events. Are You Ready for a Kelimutu getaway? Our Ecolodges staff are ready to help you book the perfect adventure for your schedule, interests and budget. 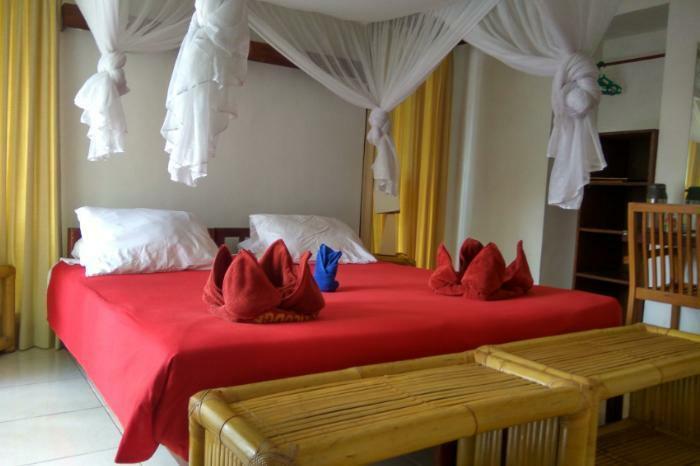 Rooms from only USD $60-$100 per night! Work with our team to design your ideal wildlife and cultural holiday. A stay at Kelimutu Ecolodge is an opportunity to enjoy unique natural treasures. There are several villages that you can weave into your Flores Island adventure. Each village offers a chance to experience the unique habits and challenges of the Lionese people. They produce some of the most beautiful Ikat (traditional weavings) in the country. You can see how these intricate artworks are produced from start to finish including the natural dyeing process. While you are there, share a drink with friendly locals and experience authentic village life. Supporting local artisans is one of the many community development programs that we undertake. The Kelimutu area is rich with bird life and contains some of the endemic species of Flores. We bring our bird tours here utilising specialist local guides who know the birds of their respective areas. If you are not booking a birding tour and wish to make birding a priority during your stay please inform our booking team and we will do our best to match you with a specialist guide. Enjoy the mountains and stunning landscape of the countryside. As well as the Kelimutu there are many other mountains in the area. This is paradise for nature lovers and a great place to combine birding and hiking. Discover some Indonesian history! Ende is the capital of the Regency. Here you can visit the former home of Sukarno, Indonesia's first President (1945 – 1966). This is a great stop when coming from or to the airport and can be combined with village visits where you can get a feeling for how remote life can be. Flores is home to several impressive waterfalls, with varying degrees of walkability. The island of Flores is very mountainous and contains some spectacular water falls. The Kelimutu area is no exception and near the lodge there are several where you can relax and even swim under some of them. Flores Island is a geothermal hot spot and there are several springs where you can bathe with the locals in natural hot mineral pools. Some are in close proximity to the lodge. Our Specialist Art Tours are hosted by our own international guides and instructors. Whether painting or sketching is your thing, artists of any type and proficiency can enjoy this painters paradise. The lakes change all the time, so there is always a new perspective. Art tours are adaptable to any size of group. For a cultural treat we can arrange local dancing at the lodge (please book in advance). This is a fantastic evening where you dance with the locals and hear singing from a choir of our own staff. 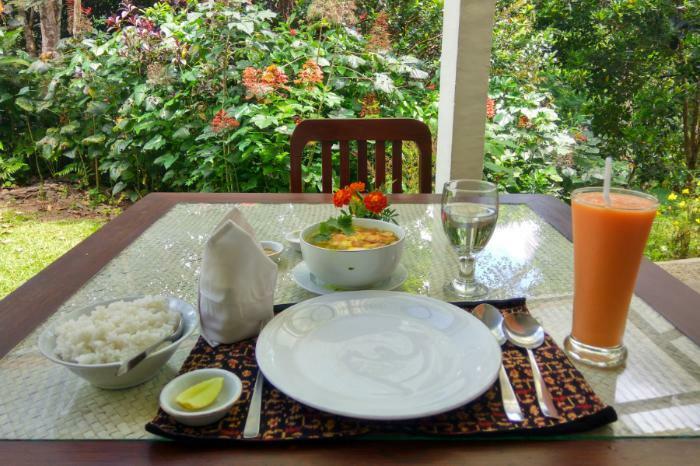 Q: Do you offer food at Kelimutu Ecolodge? A: Yes we offer breakfast, lunch and dinner as well as hearty prepared lunches for those who head out for tours and hiking adventures. Our breakfasts include local and Western options as well as our chef’s famous pancakes and of course – rich local coffee. The open air dining area is a great place to chat with fellow travellers and local staff in a very friendly atmosphere. At the bar, you can enjoy coffee and tea at any time, as well as soft drinks, beer and some local wines. Q: Can you help me book my flights to Flores? A: Yes! Ecosafari Indonesia can assist with all your booking needs. Please visit our contact page to connect with our team. Q: How do I combine my stay at Kelimutu with other Ecolodges and tours? A: If you wish to enjoy experiences from other Ecolodges sites we can assist in creating the ideal tour for your interests, schedule and budget. Choose between our four distinct properties and decide what you want to see and we will help you with bookings, flights and transfers. Q: How long should I stay at Kelimutu Ecolodge? A: We suggest a stay of 3 nights and 4 days to enjoy a real experience of the area, unless you are joining a special interest group such as birding or art tours in which case the average stay is longer. Q: What makes the Kelimutu Ecolodge “eco”? A: Apart from our Conservation Fund, which currently supports the development of eco homestays, we are committed to ecological sustainability in the area around the lodge recording birds and butterflies (indicator species) and some flora species. The recycling of all water through 3 garden systems. This irrigates the garden whilst preventing pollution from entering the river. Drinking water comes from a U.V. purifier. We have a system of solar panels, storage batteries and inverters which blend solar power with the small amount of local electricity available. We recycle, reuse and as a last resort, send refuse to Maumeres dump. Our kitchen waste is all composted or given to pigs. All our staff are local villagers including our Manager who lives in Moni village. Over 80% of our net profits are reinvested into new ecolodges or development in our current ecolodges, for example: expanding our usage of solar energy. Q: How can I contribute to the area? A: A percentage of your Ecolodge stay contributes directly to our conservation efforts in Flores as well as to the local staff we employ. Likewise your interest in the local people and buying their crafts makes a difference. Please enjoy the natural wonders of the area and take care not to leave anything behind. If you have a chance to preserve power or avoid waste then please do! Kelimutu Ecolodge plays an important role in creating sustainable local jobs and is currently the biggest tax payer in the local regency. Q: What is a suitable age for children to be at Kelimutu Ecolodge? A: Babies carried by their parents are welcome. There is one cot available and a high chair. Remember it can be cold up at the crater lakes. Toddlers are welcome but would have to be carried on walks. The crater lip, and the river could be dangerous to unsupervised children. Older children are welcome but would have to be able to walk on the treks. Children must be supervised at all times and obey the instructions of the Guide. CHILDREN ARE SOLELY THE RESPONSIBILITY OF THE PARENTS.